What would be the proper procedures for Upgrading a Project from one build to another, i.e. 15.1.5 to 15.1.6? I know that DevExpress has a project converted that makes this very easy for their controls, but I have found it tedious to update Xafari. Is there a easier or quicker way other than remove it from the project and then readding it back in? I am sorry that for now upgrading to the new Xafari build is not so convenient as it should be. For now you can speed up the upgrading process of your solutions by replacing the old Xafari version for the new one in all .csproj, .config and .licx files. 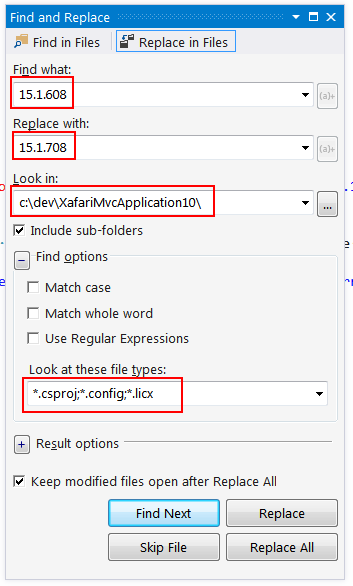 You can use "Replace in Files" function in the Visual studio. See the screenshot at the link https://galaktika-soft.com/wp-content/uploads/2015/09/Visual-Studio-Replace-in-Files-dialog.png.